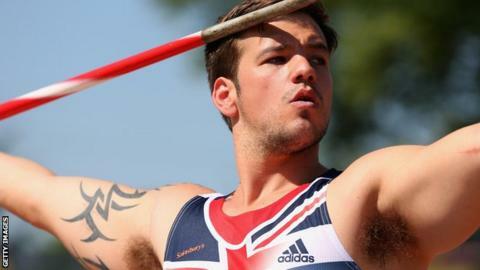 Nathan Stephens says the dismissal of his appeal against a foul throw in the javelin final at the IPC European Championships is a kick in the teeth. His unsuccessful appeal means he finished fourth for Great Britain in the F57 category in Swansea. There was success for 18-year-old Olivia Breen, who claimed bronze in the T38 100m with a time of 13.96, and Kyron Duke, 21, who won silver in the F41 javelin with a throw of 36.70m. Despite being the first Welsh athlete to win a silver, Duke was not happy with his throw as it was almost two metres short of his personal best. Germany's Mathias Mester won gold with 38.69m, while Poland's Bartosz Tyszkowski took bronze. "I'm pleased with the medal but not so much the distances," said Duke. "I've done a lot better in training the last couple of months. It's gets really annoying when you're out there and it doesn't go as far as you want it to go." The Cwmbran athlete is hopeful of another medal in the F41 shot put on Saturday. Breen, who was competing in her second event of the Championships, was pleased with her performance on the track. She said: "I'm just getting better and better. I'm really happy with how I ran." The teenager could win another medal in the F35/F38 4x100m relay on Saturday, an event she won bronze in at London 2012. Stephens meanwhile is turning his attention to Rio 2016. Speaking after his appeal was dismissed, the 26-year-old said: "I'm just disappointed that seated throws have taken a backward step rather than pushing forward like every other Paralympic sport. Olivia Breen narrowly missed out on a medal when she finished fourth in the T38 long jump. "We've just got to go back to the drawing board to try and find the right way to utilise my body. "We need to sit down, have a discussion and maybe contact IPC to see what they suggest." Russia's Alexey Ashapatov threw 34.19m to win gold, ahead of Allahverdi Allahverdiyev of Azerbaijan and Greece's Angim Ntomgkioni. Stephens' javelin throwing style was also judged illegal at London 2012.